Nearly 25 years ago, a portly, fictional motivational speaker named Matt Foley—R.I.P. Farley—made the phrase “living in a van down by the river” a cultural punchline. That same year, T.J. Burke and Dexter Rutecki’s van provided them little glamour as they suffered through the Colorado cold, naïve Midwesterners lost in Aspen. Except for a small cult of parking lot ski bums, for the ‘90s and the early 2000s “van life” had become a humorous measuring stick on failure. Then there was the Great Recession, and social media, and smartphones. A transient, interconnected generation turned the pound sign into a hashtag, “glamping” into a lifestyle, and now “living in a van” isn’t a term for poverty—it’s a fashionable sign of freedom. The proof is on the social feeds: The micro bus by the beach. The Westfalia barreling through the redwoods. Some yogi posed Lotus in the pop top. That’s kind of what Chris Benchetler is up to. But not really. Chris, like many others of his age, is a newly anointed van owner. And that van even has a name: The Stealthy Marmot. It’s a Sprinter 4×4, fully built out by Benchetler himself. 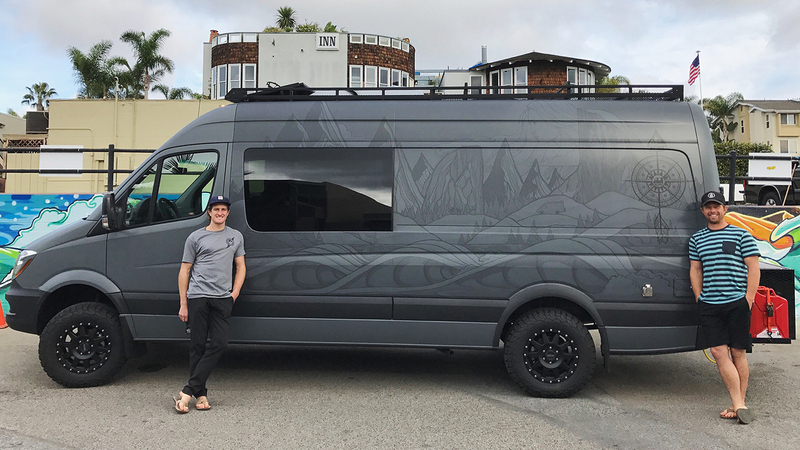 Chris is a lifelong artist, and it only takes a quick glimpse at the vehicle to see it is as much a work of art as a functional abode. 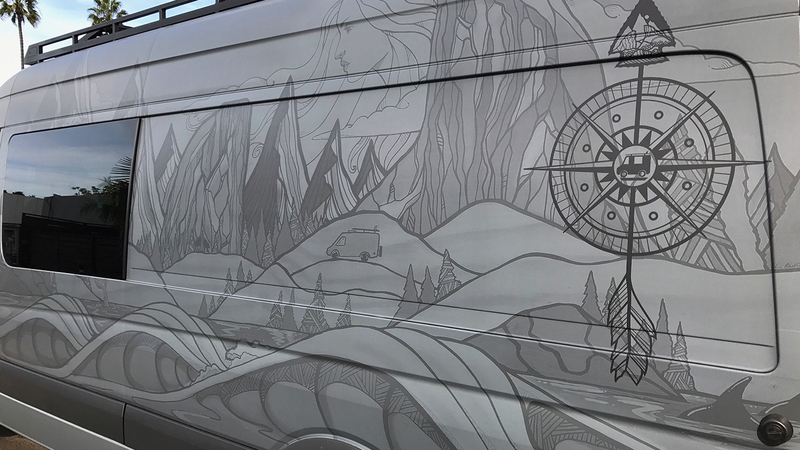 From the beautiful interior carpentry to the full-wrap waves and mountains covering the outside, the van could be considered an art exhibition on wheels. But that attention to detail extends beyond aesthetics; the Marmot is also designed to serve as a rolling video production house. Along with video-guru and badass-follow-cammer Matt Cook, Benchetler is planning to drive the Marmot from his home in California north to Alaska, documenting every turn along the way. Benchetler has long been about the DIY approach. 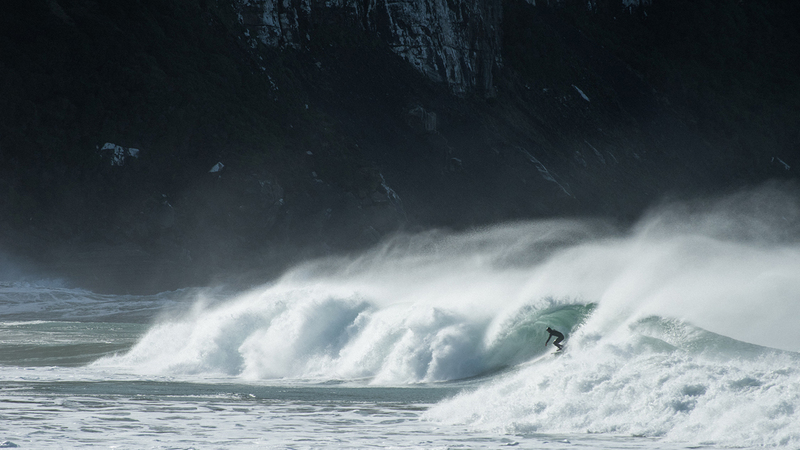 From the Nimbus days to last winter’s Chasing El Nino series, he knows how to produce. Adventures ala The Stealthy Marmot is the latest proof. It’s life in a van, elevated. TSKJ: The Stealthy Marmot—not exactly the most imposing of names. What’s the story behind that? CB: [Laughs] Not really any great story behind it. There’s a lot of van builds out there that have names of tough predators, like the grey wolf or the black bear, so we were kind of making a joke and tried to choose a more insignificant animal. The Stealthy Marmot stuck. TSKJ: What are your plans for the winter? Where is the van going? 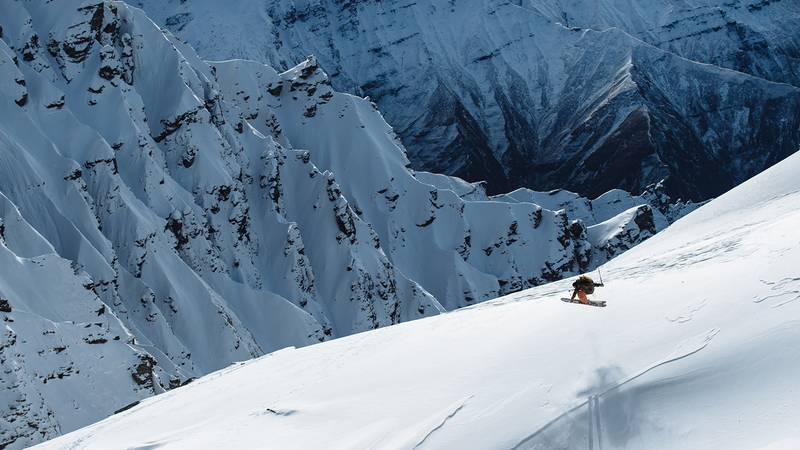 CB: I am going to ski, surf, climb and snowboard my way to Alaska. I plan to meet up with individuals that have mastered each of those sports. 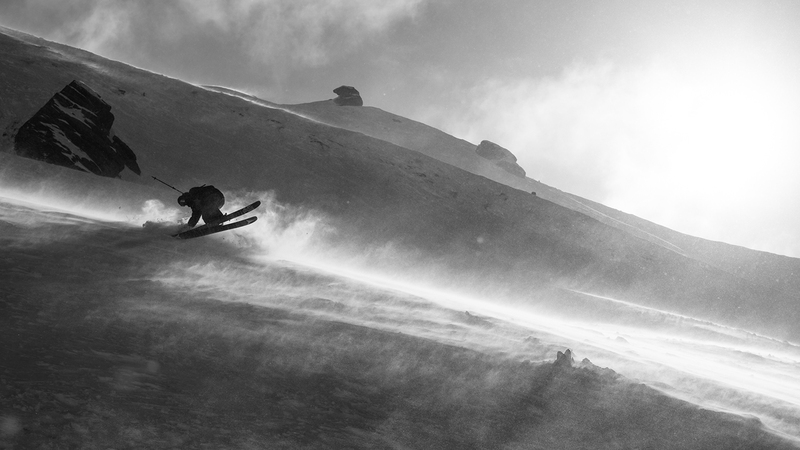 Surfing has been a huge influence and inspiration to my skiing and the way I try to draw lines down the mountain and read terrain. Climbing has been a massive inspiration in my mental game, as well as a deeper connection to myself and the mountains. And skiing has been what’s defined me as a person. It’s been my main passion in life for as long as I can remember, so drawing the parallels between each of those sports all while trying to live simply is the goal of the series. TSKJ: Was this your first go at van conversion? Who helped you? And what inspired you? CB: Definitely my first go. I had no idea how extensive of a process it was going to be. Fortunately, my friend Scott Smith is an insanely talented finish carpenter. He too had never built out a van, but his knowledge of building homes and tiny homes paid off tremendously. As far as design, several vans inspired me, but Scott and I tried to draw a blueprint that would be most functional for the project. 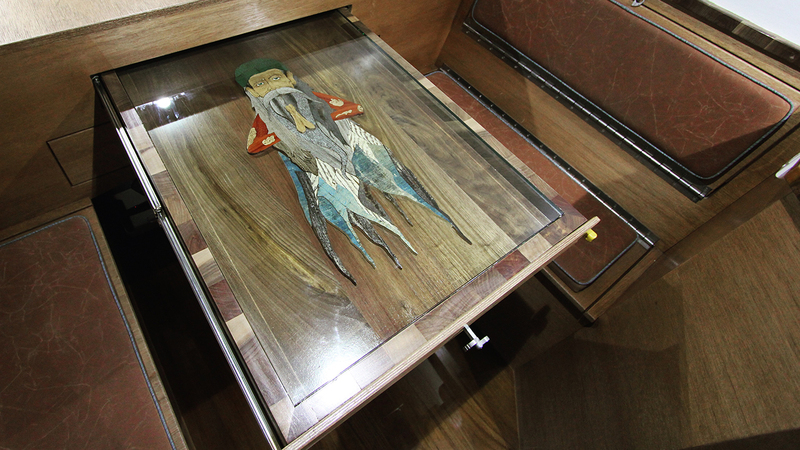 Then all the mosaics and art inside the van came from Scotty, which was in part inspired by and recreations of some of my artwork. That was really cool to see come to life. TSKJ: How’s your technical terminology now? CB: [Laugh] I learned a lot, but it was such an expedited course, I think a lot of it may escape me. I had to be on autopilot and just do what needed to be done. The hardest part and most research went into the electrical system, learning the differences between DC/AC, and calculating the amount of amperage and wattage I consume on a daily basis. It was quite frightening to see it all broken down on paper and realize how much [electricity] we’d be using to film a series. TSKJ: You’re documentation of the process has been detailed, why is it important for you to share what you’re learning? CB: I had such a hard time finding valuable info when I was searching, and so we decided we wanted to document it well and share our experience. I created an Instagram for the van, @TheStealthyMarmot, on which I plan to consistently roll out info on what we did, along with a bit of a description behind it. TSKJ: Single best piece of advice to anyone trying to do the same? CB: Hire Scott Smith [laughs]. But seriously—you should. There is so much to know and learn, and I wouldn’t have such an incredible van without his knowledge. Next to the electrical, the most valuable thing I learned from Scotty was the amount of VOC’s [Volatile organic compounds, a family of chemicals often associated with human health and environmental problems] that are in vehicles, paints and building materials. We built the entire van to be chemical/VOC free, or at least as low as possible, which was a massive undertaking. TSKJ: And why take the time to make it so detailed? Seems like you’re really going above and beyond. CB: To be totally honest, it’s very functional. I just had great fortune of having support from all my sponsors alongside Scotty to make it the dream machine. Plus, my filmer and I will be living out of it, making edits out of it, and driving it to AK, so the amount of power consumption, insulation, storage needs, etc., are huge. I had to cover my bases. As far all of the art, that was an opportunity for Scotty to make it very personal to me, as well as showcase a few of his skills. TSKJ: It seems like you gravitate toward the DIY approach, why is it important for you take on a van build out and producing ski shorts? CB: I think it’s very valuable to have creative control of my content and goals. I’ve learned a lot from Eric Pollard and Nimbus Independent. As things slowed down over there, I wanted to make sure I was still able to express myself in a way that was true to me. I want to continue to be inspired by skiing, and not lose sight of why I do it, so by having control and doing what I want it will continue to drive and inspire me for many years to come.